Derek Hill has certainly not had an easy go of things since he was first drafted by the Detroit Tigers as a first-round pick in 2014 at the ripe old age of 18. His first season with the Single A affiliate West Michigan Whitecaps was interrupted multiple times with trips to the disabled list, and just when he seemed to be realizing his potential in 2016, he found out he needed Tommy John surgery. Now, after being out of baseball for months, he's finally back in West Michigan and patrolling the green in center field, making ridiculous plays look easy. But for as much as Whitecaps fans (and Tigers fans who know the value he brings to the table) are excited to have him back, he's even more thrilled than the paying customers: "I really can't put it into words because I'm just so excited to be playing baseball again ... I mean, I was down in GCL doing it, but it's not the same atmosphere as being here [in West Michigan] -- the fans are unbelievable here, the atmosphere is outstanding." The atmosphere gets even more electric when Hill makes the kinds of plays he made during Thursday night's win against the Twins' Single A affiliate, the Cedar Rapids Kernels. Twice during that game, he robbed batters of what should have been certain base hits, flashing his elite-level speed and all-out effort as he slid and dove to catch soft bloopers and line drives headed for the gaps. While Hill says everything "feels 100 percent" right now and "for the most part I'm out of the 'rehab'," the Whitecaps are still following a careful process. "Right now I'm pretty much doing two games in the outfield and then one game at DH, or 'off'," he says. There is no question of Hill's plus-plus defensive skills, or his 80-grade speed (he wasted no time stealing second base in his first game back with the Whitecaps on Wednesday), but whether he can bring enough value to the batter's box is a different issue. In an injury-shortened 2015, he only slashed .238/.305/.314 in 232 plate appearances. But there were obvious reasons (he was 19, it was his first full season, it was interrupted by trips to the DL), and on his return in 2016 he improved that slashline to .266/.312/.349 as part of seeing more regular playing time, logging 410 plate appearances. He was making more contact, he was making harder contact (17 doubles and six triples), and he even hit a home run. Then came the Tommy John surgery. One of the difficulties of missing extended playing time is having to come back and re-learn how to time up professional pitching. But for Hill, "it wasn't as hard as I thought it was going to be, just because of the rehab process -- going from a tee to front-toss, to BP, and then live BP, and then the game, so ... there's definitely a process that we followed pretty rigorously and it wasn't as hard as I thought." The results appear to be coming. In 14 games in the Gulf Coast League before coming back to West Michigan, Hill managed to post a .122 ISO with a double, triple, and home run in 60 plate appearances, and even more encouragingly, he put up a 16.7 percent walk rate -- the highest of his career so far. 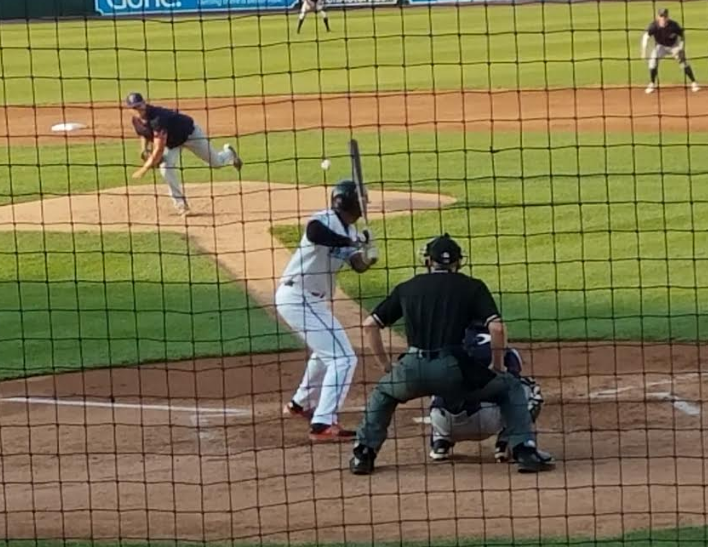 Already in just two games with the Whitecaps, he's drawn three walks (one of which he immediately turned into a "double" by swiping second base). For now, Hill has one objective in 2017: "Just ... stay healthy, that's the main goal. That's always been the main goal," he says, while adding with a sheepish grin, "obviously I've come up short on that a couple of times." So how does he plan to accomplish that, especially with this much injury history already on his ledger? "Our strength-training guys down in Lakeland did an absolutely outstanding job, building me up, and hopefully that's the ticket -- I'm just going to keep moving forward, keep working hard," says Hill. If he can stay healthy, he's already shown he can make improvements at the plate. And if he can improve at the plate, his astonishingly good defense and speed on the basepaths will easily propel him into a full-time position as the starting center-fielder at Comerica Park. The Tigers could certainly use that. It's been a while since we've had a center-fielder this good.